This post is inspired by a recent blog from another preemie mom at premmeditations.wordpress.com. She is smart and honest; she tells it like it is. I connect with her posts. Earlier this week, she posted something that went right to the depths of my heart. She wrote a letter to herself giving permission to let go of the guilt she carried since her son was born prematurely. And then she challenged the rest of us to do the same. I’m just going to come right out and say it: It was not your fault. Your pregnancy was healthy and normal – the doctors saw no cause of concern. At your last doctor’s appointment you asked for information about the signs of pre-term labor. Your doctor said “It’s too early for that. We’ll talk about it next month.” You trusted him. So when you started feeling some cramps on vacation, you thought it was just what happened to pregnant women about to enter their third trimester. I know you feel guilty because you did not recognize the signs. (Wait – were there even signs to recognize?) Your doctor said all was well. None of the other women you were with thought there were red flags, either. And they had all had children before! Your books said that some cramping was common and was no cause for alarm. You didn’t even feel the contraction that was registering on the monitor in the ER. There was absolutely nothing that you did to cause Jaxson’s early birth. I repeat: you did not do anything wrong. You ate well, you exercised, you had regular prenatal check-ups. You rested when you were tired. You took your vitamins and folic acid every day. You were healthy, you made good choices. You did nothing wrong! You need to let go of the what-ifs. It’s not logical thinking about what would have happened if you would have been able to keep Jax in longer. It does no good thinking about what would have happened if you would have been able to recognize that you were in labor or that something was wrong. Jax was born 4 months early. And it was not your fault! It happened the way it happened and no amount of worrying or thinking or stressing will change that. I know how grateful you are that Jax is a happy little boy who is growing and learning like it’s going out of style. But, it’s ok to feel overwhelmed with managing Jax’s care. It’s ok to be overwhelmed by 6 doctors appointments in one week. It’s ok to feel overwhelmed with the mountains of paperwork that goes with having 12 doctors that regularly see Jax. It’s ok to be scared when your baby can’t catch his breath. It’s ok to feel sad when you have to give his daily nebulizer treatments. 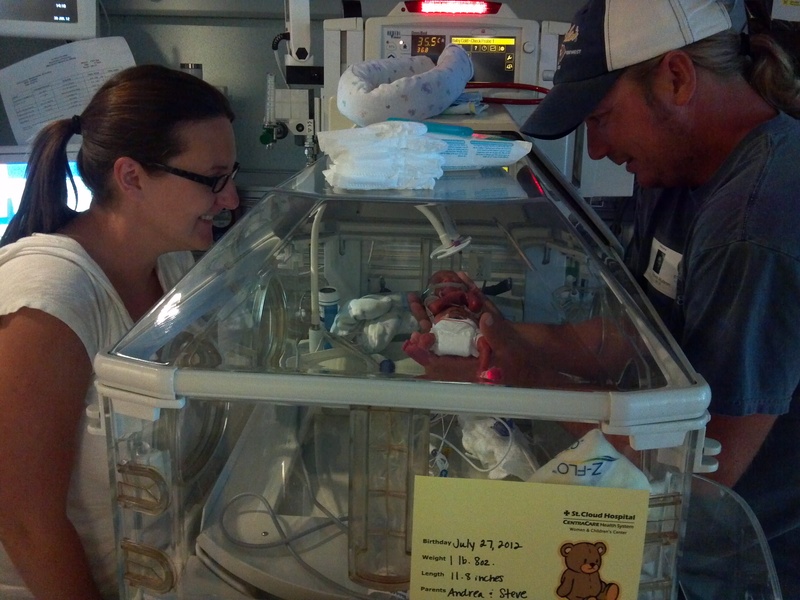 It’s ok to be aware that there may be long term effects from his prematurity. Waiting for answers is hard. His doctors are on the ball – they are smart and capable. You do a good job of not worrying about things until a doctor tells you it’s time to worry. I’m proud that you don’t go overboard by Googling every possible outcome. I’m glad that you can roll with the punches and stay strong for Jax. I’m happy that you have time to spend with Jax each day. I’m glad that you and your little boy have such a great time singing, laughing, playing, and learning together. But, you have my permission to let go of the guilt that comes with having a child who was born 17 weeks early. It’s not your fault. Oh goodness. What a terrific post. I nodding in recognition of every sentence. I hope deep down, somewhere you know it’s not your fault and that you can take credit for all of Jax’s totally amazing achievements, achievements forged of love and determination on your part. I’m proud you linked this up and the image is just wonderful. I met set up a Pinterest account just to pin this. Thank you! Thank you for inspiring me to write this! I can’t believe how freeing it was. I feel better just having put it all out there! Thanks for sharing, Jean. Joey’s Down Syndrome was not your fault! He is definitely a blessing to our family! I can’t wait for Joe and Jax to meet again on Father’s Day at the Hanzel’s – I think they will get along great. I hope you’re having a great time on your trip! Good job on working to let go of the guilt. I’m glad you recognize that it wasn’t anything YOU did or didn’t do wrong. You now have an amazing little guy who has helped you to grow stronger in ways we never could have imagined before. Keep up the great work at the greatest job of all; Parenting. Thanks, Jody! Parenting is fun and hard and challenging and awesome all at the same time! Beautiful Andrea. Sending you love.